Teacher's Testimonials – Our world becomes one. The struggle to become the best teacher is real. Advice on improving my practice bombards me. I can always improve my classroom management, high leverage lessons, cognitive load, seating selection, social and emotional learning, PBIS, depth of understanding, classroom appearance, independent practice, test scores, and the constant drive to be better. Various amounts of information plague my being, creating a sense of urgency for the gaps that I can fill. I lose myself in the career, because I find that the alternative will negatively impact students. I must follow various initiatives, fatiguing myself and making my passion towards change feeling like a burden. Students become test subjects in a slurry of initiatives designed from people who have not taught for decades. I begin to improve in one skill to find that there is a new and improved approach. I rarely feel accomplished. Several tools are placed in the toolbox, stacked in a storage space, and filled to the brim where I cannot even figure out how to use such resources. Then, I am expected to use each of these pieces simultaneously with limited time. As the clock ticks, and I realize that each moment is vital for students to achieve success; I cannot wait with idle hands, expecting change. I choose to stay in this profession, for I am passionate about my impact in the classroom. Ultimately, if I do not, there will be other teachers who come and go, for many leave. Our students deserve better and so do we. Your comment sparked some great debate stemming from the unrealistically high expectations for teachers. 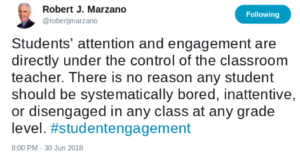 Apparently, we are the sole reason that a student is “systematically bored, inattentive, or disengaged.” There are various factors behind a student’s behavior, such as not getting enough sleep to take care of their siblings, working extra hours to support their family, not understanding the value of education for it failed them, or the systematic oppression that they have experienced in their lifetime. Such external factors still compel you to blame the educator who spends their own money, offers extra time away from family, and pours their heart and soul into a career they love. Yet, they are still constantly criticized. Critiquing others is the easy path, because it is like the audience who watches a game and gets frustrated with every move a player makes. They were never the ones who played the game. Blaming a teacher is simple, but a true master of their craft begins to figure out solutions. Our career has always been one where those on the sidelines believe they can do better, yet they choose not to teach. We put our heart and soul into this job to be judged and scrutinized, rather than being treated as experts. We know that we can do better, but we are also realistic about our time or we burn out. Suggesting that students who do not follow along are our faults is disheartening. Why do we get told we are wrong for having a variety of students with different outlooks, experiences, and situations? Understanding is difficult when one does not experience such a process. Systematic boredom is not the fault of the teacher, but rather those who have helped create expectations that meet certain students, but not each student. The institutional and systematic challenges are not with the teacher, but rather education holistically. Perhaps those exams that test “knowledge” are the issue. Perhaps the way schools are structured are the problem. Perhaps those so called systematic challenges are due to researchers who have limited knowledge best classroom practices, because they have not been in front of a class of students for years. The fans are those who do not teach, but critique. Every decision we make involves a sense of blame, because it is easy. How about using your powers of educational greatness to find clear solutions? Use evidence where you attempt your practices in classrooms, so you can legitimately share your own insights to the profession. You can try to make that difficult pass, or take a shot from a place where we may struggle, then explain the process, so we can make attempts as well. Try to find solutions, for blaming is easy. Teachers are stressed beyond measure, for they are not given the trust and opportunities to thrive. They are forced into numerous obligations, extra work, and excessive expectations. There are several passes thrown towards them, at the same time, from various directions while they are just trying to take a shot, and it never stops. The students have choices. We give them numerous tools, and we constantly strive for success so our students thrive. We want our students to do well, yet we cannot blame ourselves for those who do not pay attention, for those may cause the nights we cannot sleep. Some are the kids who take a toll on our health. We ask ourselves why the students did not learn. We cannot be fixated on such emotionally draining challenges, so just like any game, we must continue to play, and we are striving to do the best we can for each student. Schools always want you to be a super teacher, which is not realistic. Learning to respectfully decline excess expectations is fair. Teachers feel a sense of guilt when they say that they cannot attend an extra event or offer more time to support students. Work can already be overwhelming, and additional requirements are physically and emotionally draining. You are not obligated to attend every dance, spelling bee, and football game. Rather, find ways to increase engagement in your classroom. Ask yourself if the increasing obligations will help you become an effective teacher while staying at the school site long-term. If you are only going to stay two years because you are dedicating your life and soul to the job, which is exhausting, would it be better to skip the additional events so you are at the school longer? Then, if a student visits, they do not see a school filled with new faces. Longevity and stamina is key. A magnetic force fills my thoughts; a polar opposite field that draws me away from my desired ability to make a difference. My passion has not festered. Rather, I feel trapped within the confines of a rigid system that is not equitable. The achievement gap continues to divide students, placing them into cookie-cutter classes based on their socioeconomic backgrounds that determine their fates. Education appears to be a dysfunctional system that plays the role of a superior spectacle that spews a false narrative of positive results. However, although I may feel such disappointment in the system, I continue to strive towards change. I want to be a part of the solution, rather than spewing disdain. I am an educator, learner, and dreamer. I am not only hoping and commenting from a distance. I am working towards making a difference. The first day of teaching is known to be a scary phenomena for those embarking on their new journey into the profession. A first day’s impression has a tremendous impact on the student’s perception of the teacher. Some suggest that teachers should keep a rigid face with no emotions in order to express a form of superiority complex over the students, while others may recommend playing games the entire class to build rapport. Everyone has their own system. The constant advice and feedback consuming new teachers leads to a plethora of choices. Deciding the best practices can be overwhelming. Take one step at a time. Plan lessons carefully. Strategically sequenced and targeted lessons can increase engagement. Review the standards, write an objective, plan your exit ticket, and work backwards. Lesson planning effectively takes time, and practicing the skill will help. If possible, look at lessons that are rigorous, and set a high standard for students. The achievement gap is real! Ask yourself how you will get the students to meet those standards. Your students may not know the solution to the objective yet, and each student may have a different path, so plan carefully. You do not know their capabilities until you see them try with the proper tools. Avoid assuming that they cannot do something, rather figure out the process to get them to the desired goal. Ask other teachers questions. Find people with a positive mindset to support and surround you. If there are toxic teachers, stay away! The poison can seep into your own mindset and consume you with disdain. Work with those who will always be solution-oriented. As for the negative ones who may leech onto you, respectfully remind them your reason for teaching. Always remember your passion! In your class, focus on the positive rather than the negative. Many teachers call home when a student is not behaving or did not submit homework. Try calling home by sharing a story about a student who took a risk or a student who completed a challenging task. I would highly recommend positive phone calls for students who are not used to teachers sharing such comments. Show students you appreciate them with precise praise and feedback, so they will be more invested. Do not fear correcting behavior. If a student is talking out of turn, you may let them know, but do not focus on arguing or draw attention. The correction should be quick and the least intrusive. Sometimes while teaching, even walking towards a student can be an indirect way to quiet them, or pointing out positive behaviors that may cause more students to follow the lead. By doing so, you can still teach. Sing praises when you can, appreciate students for taking risks, and be authentic with the positives and corrective behavior. Keep in mind, some students will express themselves in the way that they think you see them. See the good. Always see the good. Consistency is beautiful. Planning your class rules, procedures, and placement in class will make the year much easier. Constant change can be overwhelming and lead to repetitive correction over the course of the year. We are creatures of habit, and students are bombarded with various expectations in their lifetimes, so minimizing change will lead to efficiency. Classroom management is an art that takes time to develop. Numerous strokes of paint are constantly added to the canvas with various practices, risks, mistakes, and measures that lead to a personal piece that exemplifies our own vision of education that may not satisfy everyone. The display takes time to be appreciated, but it will grow in value as long as effort is invested into the art. I know these are several spewed pieces of information. I hope it helps! Struggle can be beautiful, but not to the point where it is overwhelming. Please comment with advice you may have for those about to step into the threshold of their teacher’s journey. I wish you all a wonderful experience. To be a teacher is to be a learner. We are hungry to grow in our field. Our desire to be educated does not change. I want to grow, just as I expect my students to improve. Being a voracious reader for knowledge. I am fascinated by the immense amount of knowledge in existence. Summer is here, so I will take the time to reflect and acquire new information to add to my repertoire. Skills are assessed by the mechanical technology of testing. Some teachers find that such exams are the end goal of their course. While standards, objectives, and curriculum plan for these computer adapted grade proficiency assessments, learning should not end. Continue to teach your students. Help nourish their minds. Training for a marathon does not mean that a person stops running once they are finished. Rather, the purpose of the marathon is their joy of running. Create excitement over learning, which will lead to incredible outcomes. Teachers are expected to be perfect. With such excessive exertion, teachers burn out quickly. Within a couple of years, they decide to change courses. As a teacher who has seen such sentiments throughout my experiences, I would like to emphasize that you can make mistakes. Please understand that every student may not like your class. Teachers will not always appreciate your ideas. Administration may add pressure with initiative fatigue. Do the best you can, but embrace that you are imperfect. Focus on the positive moments, and you will prosper. Creating an optimal space for student learning is not easy. Begin by developing lessons that ensure the students are learning. Consider the objective first, connect your exit ticket, then work backwards. Figure out what you want the students to learn by the end of the period. While some activities you find online seem engaging, your lesson can keep the students interested as long as you plan well. Be careful and strategic about your delivery. Be aware of your goals and work with your students to meet the objective. Avoid spending most of the period lecturing. Rather, have them discuss, inquire, and grow. Put the cognitive load on the students, so they can learn from each other.